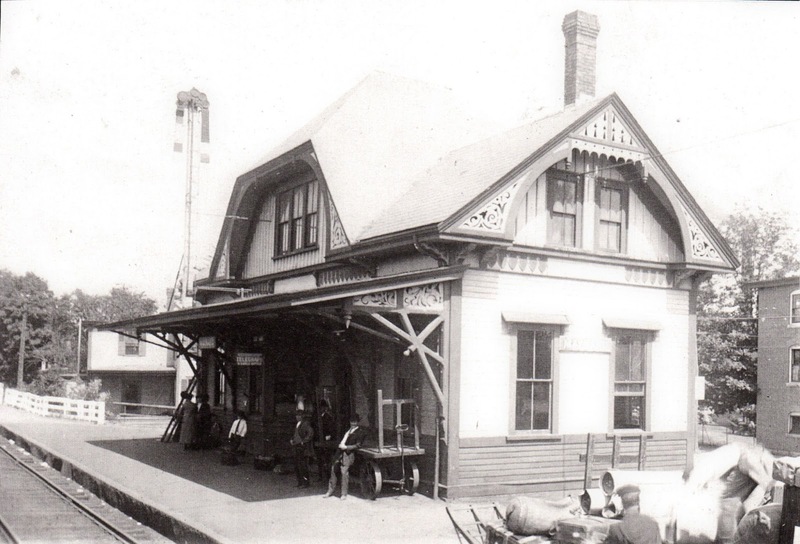 Maynard rail road station, photo taken 1910. Courtesy of Maynard Historical Society. site for a Maynard visitors' center? See articles related to construction in July, August, October and November 2016. People with long memories can recall the end of Maynard's railroad passenger service in 1958. Less noted was the decline and end of freight service in the 1960s. After decades of disuse the railroad and MBTA each gave up on resurrecting rail service. The 12.4 mile long right of way was deeded over the five communities (Acton, Maynard, Stow, Hudson and Marlborough). Some of the land was subsequently sold to private owners. And there it lay, a broken-up ghost of a railroad spur dating back to the 1850s, once traveled by as many as twenty trains a day, crossties rotting and trees growing up between the rails. The concept of converting obsolete railroads to pathways for non-motorized use, i.e., "rails-to-trails," began in Wisconsin in 1967 with the opening of the 32 mile long Elroy-Sparta State Trail. Important milestones were the National Trails System Act, which allowed for conversion of government-granted railroad right-of-ways be converted to trails, and the Transportation Equity Act (TEA-21, passed in 1998), which permitted federal funding for transportation improvements other than in support of planes, trains and automobiles. The law has gone through name changes but the goal of federal support for non-motorized transportation remains. pieces were left behind where trees had grown over the rails. According to the Rails-To-Trails Conservancy organization (railstotrails.org) there are now more than 22,000 miles of official ex-railroad trails in the United States. Another 8,000+ miles are in building or planning phases. Lengths range from the 253 mile John Wayne Pioneer Trail, Washington, to the 1.5 mile Manhattan High Line, New York. In Massachusetts, two of the best-known are the 22 mile Cape Cod Rail Trail and the 10 mile Minuteman Bikeway. Trails take two forms, either packed crushed stone or paved. The first has a much lower construction cost, but higher maintenance. The second can easily exceed $1,000,000 per mile, especially if bridges are needed. In all instances the majority of the cost is federally funded. The remainder is divided between states and towns crossed by the trails. Locally, the vision of a rail trail on the Acton to Marlborough right of way was begun in 1992 by a few interested residents acting in concert with town employees. A plus for potential funding was the intermodal nature of the concept - with the north end anchored at the South Acton train station, users could walk or bicycle to Acton to commute by train, or the reverse, commute by train to Acton to get to work in neighboring towns. To this end, the Acton train station rents enclosed bicycle lockers for $75/year, soon to go to $100/year. promote awareness and use as a walking trail. The Assabet River Rail Trail organization (ARRTinc.org) was created in 1995 to coordinate volunteer activity. The five towns voted to approve the trail in 1998. Jeff Richards was the first ARRT president, followed by Thomas Kelleher, who has served in that position since 2001. Duncan Power has been clerk for as long. ARRT members have been instrumental in fostering awareness of the proposed trail. For Acton and Maynard that included literally hundreds and hundreds of hours clearing and maintaining the right of way for hikers and bikers. While a few people have been ambivalent about the planned trail ("It's right behind my house!" or "Why does it have to be paved? "), most of the comments have been positive. Trail construction in Maynard and Acton is to start July 2016 and be completed by May 2018 (all but the final landscaping and fencing should be done by late 2017). After this 3.4 miles is completed at the northeast end, to go with the years-old 5.8 miles at the southwest end (in Hudson and Marlborough), what is planned for the middle? Negotiations are underway for Track Road, the two miles between the Maynard/Stow border and Lake Boon. Beyond that, the trail would require two (expensive to build) crossings of the Assabet River, and a wide swath of land between the bridge sites is in private ownership. An alternative would be to detour south across the Assabet River National Wildlife Refuge before turning west. This would add many (scenic) miles to the originally proposed length, but obviate the need for bridges and the repurchase of the original right-of-way. Either way, the next phase of the trail is years and years away before any possible funding. An oft-asked question is whether the Acton end of ARRT will link to the Bruce Freeman Trail, currently being extended south through the east edge of Acton, toward West Concord. There is no rail right-of-way between the two, and thus no good option for an off streets connection. One possibility would be to create a three mile long bicycle lane on School Street and Laws Brook Road. June 2013 has a long write-up on walkability of all of ARRT. Visit www.ARRTinc.org for maps, etc. An exhibit on the history of the railroad and transition to a rail trail was put on display in the Maynard town building on June 28, 2016, in anticipation of construction beginning on the Acton and Maynard portion of the trail. The display case on the main floor includes ten photographs, five pages of text showing the timelines of the railroad and the trail, and explanatory captions. One text panel explains how Amory Maynard's teenage son - Harlan - took the train to Concord to attend school at a private school run by Frank Sanborn. Harlan's classmates included Ralph Waldo Emerson's children and one of his teachers was Henry David Thoreau. The lower part of the case contains a section of original rail, baseplate, spikes and cross tie, plus extra spikes painted in Maynard school colors of black and orange. The exhibit was removed in October but it may be installed at the library in November.